The Corporation is probably the world's oldest continuously-elected local government authority. 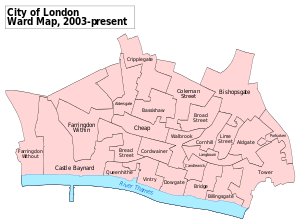 Both businesses and residents of the City, or "Square Mile", are entitled to vote in elections, and in addition to its functions as the local authority – analogous to those undertaken by the boroughs that administer the rest of London – it takes responsibility for supporting the financial services industry and representing its interests. 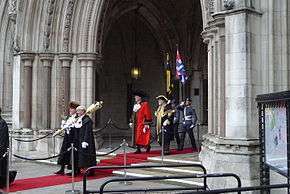 The corporation's structure includes the Lord Mayor, the Court of Aldermen, the Court of Common Council, and the Freemen and Livery of the City. There is no surviving record of a charter first establishing the Corporation as a legal body, but the City is regarded as incorporated by prescription, meaning that the law presumes it to have been incorporated because it has for so long been regarded as such (e.g., Magna Carta states that "the City of London shall have/enjoy its ancient liberties"). The City of London Corporation has been granted various special privileges since the Norman Conquest, and the Corporation's first recorded Royal Charter dates from around 1067, when William the Conqueror granted the citizens of London a charter confirming the rights and privileges that they had enjoyed since the time of Edward the Confessor. 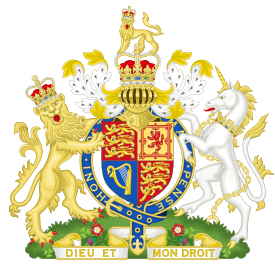 Numerous subsequent Royal Charters over the centuries confirmed and extended the citizens' rights. 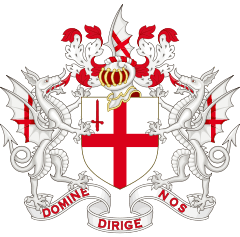 The City of London Corporation had its privileges stripped by a writ Quo Warranto under Charles II in 1683, but they were later restored and confirmed by William and Mary in 1690, after the Glorious Revolution. In January 1898, the Common Council gained the full right to collect local rates when the City of London Sewers Act 1897 transferred the powers and duties of the Commissioners of Sewers of the City of London to the Corporation. A separate Commission of Sewers was created for the City of London after the Great Fire, and as well as the construction of drains it had responsibility for the prevention of flooding; paving, cleaning and lighting the City of London's streets; and churchyards and burials. The individual commissioners were previously nominated by the Corporation, but it was a separate body. The Corporation had earlier limited rating powers in relation to raising funds for the City of London Police, as well as the militia rate and some rates in relation to the general requirements of the Corporation. The Recorder of London, the senior judge at the Central Criminal Court 'Old Bailey' who is technically a member of the Court of Aldermen; but without precedence, he processes between the senior Aldermen, i.e., forner Lord Mayors, and the junior Aldermen. a) The three Esquires at the Mansion House: The City Marshall, the Sword Bearer and the Mace Bearer (who is properly called 'the Common Cryer and Sergeant-at-Arms'); these officers run the Lord Mayor's official residence, the office, and accompany him on all occasions (usually senior military officers with diplomatic experience). b) The Chief Commoner who is elected by the Common Councilmen alone and serves for one year; until recently chaired all of the Bridge House Estates and property matters committees but is now honorific. c) The Ward Beadles; responsible to a specific Ward from which they are elected, largely ceremonial support to their respective Aldermen, and also perform a formal role at Ward Motes. Voters appointed by businesses do not forfeit the right to vote for the local council of their home residence (so long as it is outside the City). Therefore, these voters are able to vote in two separate local elections, firstly in 'the City' as appointed voter for their employers, or fellow employees and secondly for the local council where their home is situated. Each ward may choose a number of Common Councilmen. A Common Councilman must be a registered voter in a City Ward, own a freehold or lease land in the City, or reside in the City for the year prior to the election. He must also be over 21; a Freeman of the City; and a British, Irish, Commonwealth or EU citizen. Common Council elections are held every four years, most recently in March 2009. Common Councilmen may use the postnominals CC after their names. 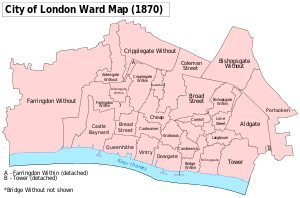 Since a by-election in the Ward of Portsoken on 20 March 2014 the political composition of the Court of Common Council has been 99 independent members and one Labour Party member. The City of London has only one directly-maintained primary school. The school is called the Sir John Cass's Foundation Primary School (ages 4 to 11). The school is the only voluntary-aided Church of England primary school in the City of London. 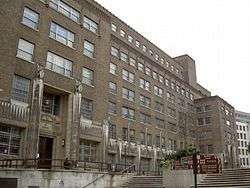 The school is maintained by the Education Service of the City of London. City of London residents may send their children to schools in neighbouring local education authorities (LEAs). For secondary schools children enroll in schools in neighbouring LEAs, such as Islington, Tower Hamlets, Westminster and Southwark. Children who have permanent residence in the City of London are eligible for transfer to the City of London Academy, Southwark, a state-funded secondary school sponsored by the City of London located in Bermondsey. The City of London Corporation also sponsors City Academy, Hackney and City of London Academy, Islington. The City of London controls three other independent schools – the City of London School for Boys, the City of London School for Girls, and the co-educational City of London Freemen's School. The Lord Mayor also holds the posts of Chancellor of City University and President of Gresham College, an educational institution for advanced study. In December 2012, following criticism that it was insufficiently transparent about its finances, the City of London Corporation revealed that its "City’s Cash" account – an endowment fund built up over the past 800 years that it says is used "for the benefit of London as a whole" – holds more than £1.3bn. The fund collects money made from the corporation’s property and investment earnings. ↑ "The Heraldic Dragon". Sacred-texts.com. ↑ "History and Heritage". City of London website. Retrieved 13 January 2013. ↑ "The Court of Common Council" (PDF). City of London Corporation. Retrieved 1 August 2010. ↑ Lambert, Matthew (2010). "Emerging First Amendment Issues. Beyond Corporate Speech: Corporate Powers in a Federalist System" (PDF). Rutgers Law Record. 37 (Spring): 24. Retrieved 1 August 2010. ↑ "Development of local government". Cityoflondon.gov.uk. Retrieved 2011-10-30. ↑ "The Corporation of London, it's right and privileges". Wattpad.com. 2007-01-06. Retrieved 2011-10-30. ↑ "Corporation of London: Administrative history". The National Archives. Retrieved 1 August 2010. ↑ "History of the Government of the City of London". Retrieved 1 August 2010. ↑ Sharpe, Reginald R., ed. (1899). Introduction. Calendar of letter-books of the City of London: A: 1275-1298. British History Online. Retrieved 2013-05-28. ↑ "About the City". Cityoflondon.gov.uk. ↑ Example usage: interpretation clause in the Open Spaces Act 1906. ↑ "Police Reform and Social Responsibility Act 2011". Legislation.gov.uk. 26 October 2011. Retrieved 12 December 2011. ↑ Fraser, Stuart (28 September 2007). "Response: The City of London is not above the law. Our elections are free and fair | Comment is free". The Guardian. UK. Retrieved 12 December 2011. ↑ Shaxson, Nicholas (February 24, 2011). "The tax haven in the heart of Britain". New Statesman issue, The offshore City. Retrieved May 27, 2016. ↑ Ramblers. "Corporation of London Open Spaces | Home | Ramblers, Britain's Walking Charity". Ramblers.org.uk. Retrieved 12 December 2011. ↑ "Green spaces". City of London. Retrieved 27 July 2012. ↑ "Management of our Green Spaces". City of London Corporation. Retrieved 22 February 2015. ↑ Cityoflondon.gov.uk Archived 5 September 2006 at the Wayback Machine. ↑ Cityoflondon.gov.uk Archived 8 February 2007 at the Wayback Machine. ↑ Monbiot, George (31 October 2011). "The medieval, unaccountable Corporation of London is ripe for protest". The Guardian. Retrieved 13 January 2013. ↑ "City of London funds". City of London website. ↑ Rawlinson, Kevin (20 December 2012). "City of London Corporation to reveal details of £1.3bn private account". The Independent. Retrieved 13 January 2013.